Donald Richard "Don" DeLillo (born November 20, 1936) is an American novelist, playwright and essayist. His works have covered subjects as diverse as television, nuclear war, sports, the complexities of language, performance art, the Cold War, mathematics, the advent of the digital age, politics, economics, and global terrorism. Initially a well-regarded cult writer, the publication in 1985 of White Noise brought him widespread recognition. It was followed in 1988 by Libra, a bestseller. DeLillo has twice been a Pulitzer Prize for Fiction finalist (for Mao II in 1992 and for Underworld in 1998), won the PEN/Faulkner Award for Mao II in 1992 (receiving a further PEN/Faulkner Award nomination for The Angel Esmeralda in 2012), was granted the PEN/Saul Bellow Award for Achievement in American Fiction in 2010, and won the Library of Congress Prize for American Fiction in 2013. After graduating from Cardinal Hayes High School in the Bronx in 1954 and from Fordham University in the Bronx with a bachelor's degree in Communication Arts in 1958, DeLillo took a job in advertising because he couldn't get one in publishing. He worked for five years as a copywriter at the agency of Ogilvy & Mather on Fifth Avenue at East 48th Street, writing image ads for Sears Roebuck among others, working on “Print ads, very undistinguished accounts...I hadn’t made the leap to television. I was just getting good at it when I left, in 1964." DeLillo published his first short story, "The River Jordan", in Epoch, the literary magazine of Cornell University, in 1960 and began to work on his first novel in 1966. Discussing the beginning of his writing career, DeLillo said, "I did some short stories at that time, but very infrequently. I quit my job just to quit. I didn't quit my job to write fiction. I just didn't want to work anymore." Reflecting in 1993 on his relatively late start in writing fiction, DeLillo said "I wish I had started earlier, but evidently I wasn’t ready. First, I lacked ambition. I may have had novels in my head but very little on paper and no personal goals, no burning desire to achieve some end. Second, I didn’t have a sense of what it takes to be a serious writer. It took me a long time to develop this." In 1964, DeLillo resigned from the advertising industry, moved into a modest apartment near the Queens-Midtown Tunnel ("It wasn’t Paris in the 1920s, but I was happy" DeLillo has said of this time), and began work on his first novel. Reflecting on the early days of his writing career, DeLillo remarked: "...I lived in a very minimal kind of way. My telephone would be $4.20 every month. I was paying a rent of sixty dollars a month. And I was becoming a writer. So in one sense, I was ignoring the movements of the time." DeLillo's first novel, Americana, was written over the course of four years and finally published in 1971, to modest critical praise. Americana concerned "a television network programmer who hits the road in search of the big picture". This novel was later revised by DeLillo in 1989 for paperback re-printing. Reflecting on the novel later in his career, DeLillo admitted, "I don't think my first novel would have been published today as I submitted it. I don't think an editor would have read 50 pages of it. It was very overdone and shaggy, but two young editors saw something that seemed worth pursuing and eventually we all did some work on the book and it was published." Later still, DeLillo still felt a degree of surprise at Americana being published, noting "I was working on my first novel, Americana, for two years before I ever realized that I could be a writer [...] I had absolutely no assurance that this book would be published because I knew that there were elements that I simply didn't know how to improve at that point. So I wrote for another two years and finished the novel. It wasn’t all that difficult to find a publisher, to my astonishment. I didn't have a representative. I didn’t know anything about publishing. But an editor at Houghton Mifflin read the manuscript and decided that this was worth pursuing." Americana was followed in rapid succession by the American college football/nuclear war black comedy End Zone (1972) –written under the working-titles “The Self-Erasing Word” and “Modes of Disaster Technology”– and the rock and roll satire Great Jones Street (1973), which DeLillo later felt was "...one of the books I wish I’d done differently. It should be tighter, and probably a little funnier." In 1975, he married Barbara Bennett, a former banker turned landscape designer. Following this early attempt at a major long novel, DeLillo ended the decade with two shorter works. Players (1977), originally conceived as being "[...] based on what could be called the intimacy of language. What people who live together really sound like," concerned the lives of a young yuppie couple as the husband gets involved with a cell of domestic terrorists. Its 1978 successor, Running Dog (1978), written in a brief four-month streak of writing, was a thriller concerning numerous individuals hunting down a celluloid reel of Hitler's sexual exploits. Of Running Dog, DeLillo remarked in his 'Rolling Stone interview that "What I was really getting at in Running Dog was a sense of the terrible acquisitiveness in which we live, coupled with a final indifference to the object. After all the mad attempts to acquire the thing, everyone suddenly decides that, well, maybe we really don't care about this so much anyway. This was something I felt characterized our lives at the time the book was written, in the mid to late seventies. I think this was part of American consciousness then." Reflecting on his first six novels and his rapid writing turnover later in his career, DeLillo remarked, "I wasn't learning to slow down and examine what I was doing more closely. I don't have regrets about that work, but I do think that if I had been a bit less hasty in starting each new book, I might have produced somewhat better work in the 1970s. My first novel took so long and was such an effort that once I was free of it I almost became carefree in a sense and moved right through the decade, stopping, in a way, only at Ratner's Star (1976), which was an enormous challenge for me, and probably a bigger challenge for the reader. But I slowed down in the 1980s and '90s." DeLillo has also acknowledged some of the weaknesses of his 1970s works, reflecting in 2007: "I knew I wasn’t doing utterly serious work, let me put it that way." With the publication of his eighth novel White Noise in 1985, DeLillo began a rapid ascendancy to being a noted and respected novelist. White Noise was arguably a major breakthrough both commercially and artistically for DeLillo, earning him a National Book Award for Fiction and a place among the academic canon of contemporary postmodern novelists. DeLillo remained as detached as ever from his growing reputation: when called upon to give an acceptance speech for the Award, he simply said, "I'm sorry I couldn't be here tonight, but I thank you all for coming," and then sat down. The influence and impact of White Noise can be seen in the writing of such authors as David Foster Wallace, Jonathan Lethem, Jonathan Franzen, Dave Eggers, Martin Amis, Zadie Smith and Richard Powers (who provides an introduction to the 25th Anniversary edition of the novel). 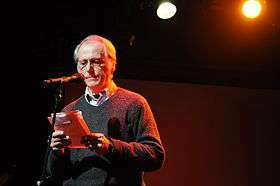 Among the 39 proposed titles for the novel were “All Souls”, “Ultrasonic”, "The American Book of the Dead", "Psychic Data" and "Mein Kampf"; however, DeLillo acknowledged in a 2005 interview that White Noise was a fine choice, remarking "Once a title is affixed to a book, it becomes as indelible as a sentence or a paragraph." DeLillo followed White Noise with Libra (1988), a speculative fictionalized take on the life of Lee Harvey Oswald up to the 1963 assassination of John F. Kennedy. For this novel DeLillo undertook a vast research project, which included reading at least half of the Warren Commission report (subsequently DeLillo described it as "...the Oxford English Dictionary of the assassination and also the Joycean novel. This is the one document that captures the full richness and madness and meaning of the event, despite the fact that it omits about a ton and a half of material.") Originally written with the working title of either "American Blood" or "Texas School Book," Libra became an international bestseller, one of five finalists for the National Book Award, and winner of the next year's Irish Times Aer Lingus International Fiction Prize. The novel also elicited fierce critical division, with some critics praising DeLillo's take on the Kennedy assassination while others decried it. George Will, in a Washington Post article, declared the book to be an affront to America and "an act of literary vandalism and bad citizenship." DeLillo has frequently reflected on the significance of the Kennedy assassination to not only his own work but American culture and history as a whole, remarking in one 2005 interview "November 22nd 1963 marked the real beginning of the 1960s. It was the beginning of a series of catastrophes: political assassinations, the war in Vietnam, the denial of Civil Rights and the revolts that occasioned, youth revolt in American cities, right up to Watergate. When I was starting out as a writer it seemed to me that a large part of the material you could find in my novels – this sense of fatality, of widespread suspicion, of mistrust – came from the assassination of JFK." Following Mao II, DeLillo went to ground and spent several years writing and researching his eleventh novel. Aside from the publication of a folio short story entitled "Pafko at the Wall" in a 1992 edition of Harper's Magazine, and one short story in 1995, little was seen or heard of him for a number of years. In 1997, DeLillo finally broke cover with his long-awaited eleventh novel, the epic Cold War history Underworld. The book was widely heralded as a masterpiece, with novelist and critic Martin Amis saying it marked "the ascension of a great writer." Underworld went on to become DeLillo's most acclaimed novel to date, achieving mainstream success and earning nominations for the National Book Award and the New York Times Best Books of the Year in 1997, and a second Pulitzer Prize for Fiction nomination in 1998. The novel went on to win the 1998 American Book Award, the 1999 Jerusalem Prize, and both the William Dean Howells Medal and Riccardo Bacchelli International Award in 2000. It was a runner-up in the 2006 New York Times' survey of the best American fiction of the last 25 years. White Noise and Libra were also recognized by the anonymous jury of contemporary writers. Although they have received some acclaim in places, DeLillo's post-Underworld novels have been often viewed by critics as "...disappointing and slight, especially when held up against his earlier, big-canvas epics", marking a shift "...away from sweeping, era-defining novels such as "White Noise," "Libra" and "Underworld" to a more "spare and oblique" style, characterized by "[...] decreased length, the decommissioning of plot machinery and the steep deceleration of narrative time". DeLillo has commented on this shift to shorter novels, saying "“If a longer novel announces itself, I’ll write it. A novel creates its own structure and develops its own terms. I tend to follow. And I never try to stretch what I sense is a compact book.” In a March 2010 interview, it was reported that DeLillo's deliberate stylistic shift had been informed by his having recently re-read several slim but seminal European novels, including Albert Camus's The Stranger, Peter Handke's The Goalie's Anxiety at the Penalty Kick, and Max Frisch's Man in the Holocene. DeLillo followed The Body Artist with 2003's Cosmopolis, a modern re-interpretation of James Joyce's Ulysses transposed to New York around the time of the collapse of the dot-com bubble in the year 2000. This novel was met at the time with a largely negative reception from critics, with several high-profile critics and novelists – notably John Updike – voicing their objections to the novel's style and tone. When asked in 2005 how he felt about the novel's mixed reception compared to the broader positive consensus afforded to Underworld, DeLillo remarked: "I try to stay detached from that aspect of my work as a writer. I didn't read any reviews or articles. Maybe it [the negative reception] was connected to September 11. I'd almost finished writing the book when the attacks took place, and so they couldn't have had any influence on the book's conception, nor on its writing. Perhaps for certain readers this upset their expectations." However, subsequently critical opinions have been revised, the novel latterly being seen as prescient for its views on the flaws and weaknesses of the international financial system and cybercapital. DeLillo published Point Omega, his fifteenth novel, in February 2010. According to DeLillo, the novel considers an idea from "...the writing of the Jesuit thinker and paleontologist [Pierre] Teilhard de Chardin." The 'Omega Point' of the title "...[is] the possible idea that human consciousness is reaching a point of exhaustion and that what comes next may be either a paroxysm or something enormously sublime and unenvisionable." Point Omega is DeLillo's shortest novel to date, and he has said it could be considered as a companion piece to The Body Artist: "In its reflections on time and loss, this may be a philosophical novel and maybe, considering its themes, the book shares a place in my work with The Body Artist, another novel of abbreviated length." Reviews thus far have been polarised, with some saying the novel is a return to form and innovative, while others have complained about the novel's brevity and apparent lack of plot and engaging characters. Upon its initial release, Point Omega spent one week on the New York Times Bestseller List, peaking at #35 on the extended version of the list during its one-week stay on the list. DeLillo's first collection of short stories, The Angel Esmeralda: Nine Stories, covering short stories published between 1979 and 2011, was published in November 2011. It has received favorable reviews, and has been a finalist for both the 2012 Story Prize award and the 2012 PEN/Faulkner award for Fiction, as well as being longlisted for the Frank O’Connor International Short Story Award. New York Times Book Review contributor Liesl Schillinger praised it, saying, "DeLillo packs fertile ruminations and potent consolation into each of these rich, dense, concentrated stories." Jeffrey Lockhart’s father, Ross, is a George Soros-like billionaire now in his sixties, with a younger wife, Artis, whose health is failing. Ross is the primary investor in a deeply remote and secret compound where death is controlled and bodies are preserved until a future moment when medicine and technology can reawaken them. Jeffrey joins Ross and Artis at the compound to say “an uncertain farewell” to her as she surrenders her body. Ross Lockhart is not driven by the hope for immortality, for power and wealth beyond the grave. He is driven by love for his wife, for Artis, without whom he feels life is not worth living. It is that which compels him to submit to death long before his time. Jeffrey heartily disapproves. He is committed to living, to “the mingled astonishments of our time, here, on earth. ”Thus begins an emotionally resonant novel that weighs the darkness of the world—terrorism, floods, fires, famine, death—against the beauty of everyday life; love, awe, “the intimate touch of earth and sun.” Brilliantly observed and infused with humor, Don Delillo’s Zero K is an acute observation about the fragility and meaning of life, about embracing our family, this world, our language, and our humanity. In November 2015, DeLillo received the 2015 Medal for Distinguished Contribution to American Letters at the 66th National Book Awards Ceremony. The ceremony was held on November 8 in New York City, and was presented his award by Pulitzer Prize winner Jennifer Egan, a writer profoundly influenced by DeLillo's work. In his acceptance speech, DeLillo reflected upon his career as a reader as well as a writer, recalling examining his personal book collection and feeling a profound sense of personal connection to literature: "Here I’m not the writer at all, I’m a grateful reader. When I look at my book shelves I find myself gazing like a museum-goer." IN February 2016, DeLillo was the guest of honor at an academic conference dedicated to his work, "Don DeLillo: Fiction Rescues History", a three-day event held at the Sorbonne Nouvelle in Paris, France. Critics of DeLillo argue that his novels are overly stylized and intellectually shallow. Bruce Bawer famously condemned DeLillo's novels insisting they weren't actually novels at all but "tracts, designed to batter us, again and again, with a single idea: that life in America today is boring, benumbing, dehumanized...It's better, DeLillo seems to say in one novel after another, to be a marauding murderous maniac – and therefore a human – than to sit still for America as it is, with its air conditioners, assembly lines, television sets, supermarkets, synthetic fabrics, and credit cards." George Will proclaimed the study of Lee Harvey Oswald in Libra as "sandbox existentialism" and "an act of literary vandalism and bad citizenship." DeLillo responded "I don't take it seriously, but being called a 'bad citizen' is a compliment to a novelist, at least to my mind. That's exactly what we ought to do. We ought to be bad citizens. We ought to, in the sense that we're writing against what power represents, and often what government represents, and what the corporation dictates, and what consumer consciousness has come to mean. In that sense, if we're bad citizens, we're doing our job." In the same interview DeLillo rejected Will's claim that DeLillo blames America for Lee Harvey Oswald, countering that he instead blamed America for George Will. DeLillo also figured prominently in B. R. Myers's critique of recent American literary fiction, A Reader's Manifesto. Conor Oberst begins his song "Gold Mine Gutted" with: "It was Don DeLillo, whiskey neat, and a blinking midnight clock". Ryan Boudinot and Neal Pollack contributed humor pieces to the journal McSweeney's satirizing DeLillo. Adelman, Gary, Sorrow's Rigging: The Novels of Cormac McCarthy, Don Delillo, and Robert Stone,McGill-Queen's University Press, 2012. Schneck, Peter & Schweighauser,Philipp (eds. ),Terrorism, Media, and the Ethics of Fiction: Transatlantic Perspectives on Don Delillo, Continuum, 2010. ↑ "The Pulitzer Prizes | Fiction". Pulitzer.org. Retrieved 2013-11-23. 1 2 3 4 "Prize for American Fiction Awarded to Don DeLillo". Library of Congress. 2013-04-25. Retrieved 2013-11-23. ↑ Kevin Nance (2012-10-12). "Don DeLillo Talks About Writing - Page 3". Chicago Tribune. Retrieved 2013-11-23. 1 2 "Panic interview with DeLillo - 2005". Perival.com. Retrieved 2013-11-23. 1 2 3 4 5 6 Vince Passaro (1991-05-19). "Dangerous Don DeLillo". The New York Times. 1 2 3 4 Amend, Christoph; Diez, Georg (October 11, 2007). "Dum Pendebat Filius: Translation of "Ich kenne Amerika nicht mehr" ("I don't know America anymore")". Die Zeit. Retrieved December 30, 2011. 1 2 3 4 5 "Dancing to the music of time". The Australian. 2010-03-06. Retrieved 2010-03-16. ↑ "DeLillo Interview by Peter Henning, 2003". Perival.com. Retrieved December 30, 2011. ↑ Kevin Nance (2012-10-12). "Don DeLillo talks about writing - Page 2". Chicago Tribune. Retrieved 2013-11-23. 1 2 Ron Charles (2013-04-25). "Don DeLillo is first recipient of Library of Congress Prize for American Fiction". The Washington Post. Retrieved 2013-11-23. 1 2 3 4 5 6 7 Ed Caesar (2010-02-21). "Don DeLillo: A writer like no other". The Sunday Times. London. Retrieved 2010-08-20. 1 2 3 4 5 "Intensity of a Plot: Mark Binelli interviews Don DeLillo". Guernica. July 2007. Retrieved December 30, 2011. ↑ Passaro, Vince (1991-05-19). "Dangerous Don DeLillo". New York Times. 1 2 3 Interviewed by Adam Begley (Fall 1993). "Don DeLillo, The Art of Fiction No. 135: Interviewed by Adam Begley". The Paris Review. Retrieved December 30, 2011. ↑ "mean streak - artforum.com / scene & herd". Artforum.com. Retrieved 2013-11-23. 1 2 3 4 5 6 Alter, Alexandra (2010-01-29). "Don DeLillo on His New Book 'Point Omega' - WSJ.com". Online.wsj.com. Retrieved 2010-03-16. 1 2 3 4 5 D. T. Max. "Letter from Austin: Final Destination". The New Yorker. Retrieved 2013-11-23. ↑ Published May 7, 2007 (2007-05-07). "Our Guide to the Don DeLillo Oeuvre – New York Magazine". Nymag.com. Retrieved 2010-03-16. 1 2 Harris, Robert R. (October 10, 1982). "A Talk with Don DeLillo". The New York Times. 1 2 "Players - Don DeLillo - 1977". Perival.com. 2012-12-18. Retrieved 2013-11-23. ↑ "Running Dog - Don DeLillo - 1978". Perival.com. 2010-01-30. Retrieved 2013-11-23. 1 2 Rayner, Richard (2010-01-03). "Tuning back in to 'White Noise'". latimes.com. Retrieved 2010-03-16. 1 2 Leclair, Thomas; Delillo, Don (Winter 1982). "An Interview with Don DeLillo: Conducted by Thomas LeClair". Contemporary Literature. 23 (1): 19–31. doi:10.2307/1208140. JSTOR 1208140. 1 2 "National Book Awards – 1985". National Book Foundation. Retrieved 2012-03-28. 1 2 3 Alter, Alexandra (2010-01-30). "Don DeLillo on Point Omega and His Writing Methods - WSJ.com". Online.wsj.com. Retrieved 2010-03-16. 1 2 "White Noise - Don DeLillo - 1985". Perival.com. Retrieved 2013-11-23. 1 2 "National Book Awards – 1988". National Book Foundation. Retrieved 2012-03-28. 1 2 "DeLillo Detractors". Perival.com. Retrieved 2010-03-16. ↑ Amis, Martin (1997-10-05). "Survivors of the Cold War". The New York Times. 1 2 "National Book Awards – 1997". National Book Foundation. Retrieved 2012-03-28. ↑ Mark O'Connell (2012-09-09). "The Angel Esmeralda: Nine Stories by Don DeLillo – review". London: The Observer. Retrieved 2013-11-23. ↑ "Ransom Center Acquires Archive of Noted American Novelist Don DeLillo". HRC News. 2004-10-20. ↑ "Don DeLillo – Events of Interest". Perival.com. Retrieved 2010-03-16. ↑ "David Cronenberg journeys to 'Cosmopolis' | EW.com". News-briefs.ew.com. 2009-07-24. Retrieved 2010-03-16. ↑ Don DeLillo (2009-01-07). "Midnight in Dostoevsky". The New Yorker. Retrieved 2010-03-16. ↑ "PEN American Center – Writers Rally for Release of Liu Xiaobo". Pen.org. 2009-12-31. Retrieved 2010-03-16. ↑ Hales, Dianne R. (2010-02-01). "Don DeLillo - The Barnes & Noble Review". Barnes & Noble. Retrieved 2013-11-23. ↑ Schuessler, Jennifer (2010-02-18). "TBR – Inside the List". NYTimes.com. Retrieved 2010-03-16. ↑ Henderson, Jane (August 24, 2010). "DeLillo to receive STL Literary Award". St. Louis Post-Dispatch. Retrieved December 30, 2011. ↑ "Books: The Angel Esmeralda". Simon & Schuster. Retrieved December 30, 2011. ↑ "The Story Prize". The Story Prize. Retrieved 2013-11-23. ↑ Archived December 20, 2012, at the Wayback Machine. ↑ "The Frank O'Connor". Frankoconnor-shortstory-award.net. Retrieved 2013-11-23. ↑ Schillinger, Liesl (November 17, 2011). "Don DeLillo and the Varieties of American Unease". The New York Times. ↑ "Carl Sandburg Literary Awards Dinner". Chicago Public Library Foundation. 2013-10-23. Retrieved 2013-11-23. ↑ John Hopewell (2013-01-29). "Cronenberg, DeLillo, Branco reteam for 'Body Art'". Variety (magazine). Retrieved 2013-11-23. 1 2 Charles, Ron (2013-04-25). "Don DeLillo is first recipient of Library of Congress Prize for American Fiction". The Washington Post. Retrieved 2013-11-23. ↑ "DeLillo Wins Inaugural Library of Congress Prize for American Fiction". The Daily Beast. 2013-04-25. Retrieved 2013-11-23. 1 2 Williams, John (2013-04-25). "New Literary Prize Goes to DeLillo". The New York Times. ↑ "Cosmopolis Interviews - Rob Pattinson, David Cronenberg, Don Delillo". Oh No They Didn'tcom. 2012-04-23. Retrieved 2013-11-23. ↑ Kevin Nance (2012-10-12). "Don DeLillo talks about writing". Chicago Tribune. Retrieved 2013-11-23. ↑ John Freeman (2006-03-05). "Q&A: Don DeLillo / It's not as easy as it looks / DeLillo talks about writing plays, watching sports and movies, and defining love and death". San Francisco Chronicle. Retrieved 2013-11-23. ↑ John N. Duvall (29 May 2008). The Cambridge Companion to Don DeLillo. Cambridge University Press. p. 13. ISBN 978-1-139-82808-6. ↑ Singer, Dale. "Take Five: Don't call Don DeLillo's fiction 'postmodern'". Retrieved 16 July 2014. ↑ DePietro, Thomas (ed.) (2005). Conversations With Don DeLillo. University Press of Mississippi. p. 128. ISBN 1-57806-704-9. ↑ DePietro, Thomas (ed.) (2005). Conversations With Don DeLillo. University Press of Mississippi. p. 110. ISBN 1-57806-704-9. ↑ Bloom, Harold (2003-09-24). "Dumbing down American readers". The Boston Globe. Retrieved 2010-03-16. ↑ DePietro, Thomas (ed.) (2005). Conversations With Don DeLillo. University Press of Mississippi. p. 115. ISBN 1-57806-704-9. 1 2 3 Remnick, David, "Exile on Main Street: Don DeLillo's Undisclosed Underworld", The New Yorker, September 15, 1997. ↑ "McSweeney's Internet Tendency: DeLillo in the Outback". Mcsweeneys.net. Retrieved 2010-03-16. ↑ "Don DeLillo | The Onion – America's Finest News Source". The Onion. Archived from the original on February 19, 2010. Retrieved 2010-03-16. ↑ DeLillo, Don (December 2001). "In the Ruins of the Future". Harper's Magazine. pp. 33–40. ↑ Cohen, Patricia (September 23, 2010). "PEN American Center Names Award Winners". ArtsBeat. The New York Times. Retrieved December 30, 2011. ↑ Husna Haq (2013-04-25). "Don DeLillo becomes first writer to receive the Library of Congress Prize for American Fiction". Christian Science Monitor. Retrieved 2013-11-23. Wikimedia Commons has media related to Don DeLillo. Jacobs, Timothy. “Don DeLillo.” Conspiracy Theories in American History: An Encyclopedia. Ed. Peter Knight. Oxford: ABC-CLIO Press, 2003. 219–220.